SEBRING — Sebring was the fourth seed and Lisbon the fifth seed and they played like two evenly-matched boys basketball teams when they collided in a barnburner before a packed house in a Division II sectional championship game Friday night. In fact, the two teams were so evenly matched, the Trojans and Blue Devils took their show to overtime before Sebring took command in the extra session to claim a 61-54 win. The win vaults Sebring (13-10) into the Division IV district semifinals against No. 1 seed Springfield Local at 7 p.m Monday at the Struthers Fieldhouse. Springfield advanced Friday night with a 76-63 sectional championship win over St. Thomas Aquinas. 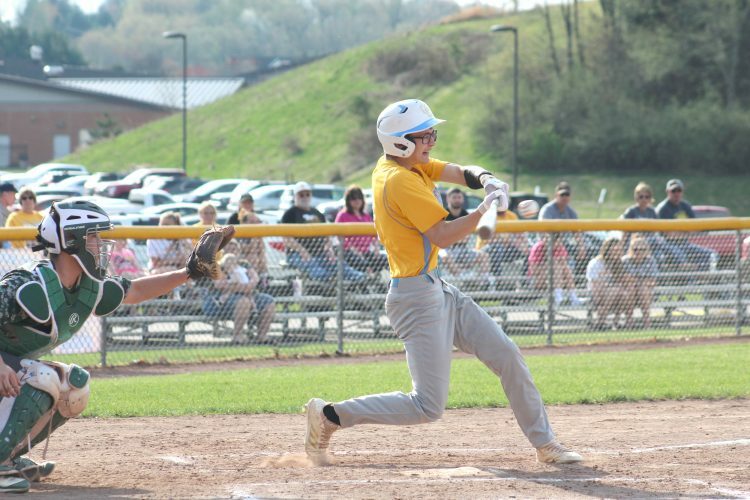 Sebring split its two regular-season meetings with Springfield. “We had awesome community (support) and it’s off to Struthers,” said Clark. Lisbon bows out of the 2018-2019 campaign with a 11-13 record. Sebring’s 6-foot-3 junior forward Gabe Lanzer, who took game-scoring honors with 20 points, including four three-pointers, accounted for five of the Trojans’ 13 points in overtime, including a three from deep in the right corner at the 2:54 mark of the extra session which gave Sebring the lead for good at 51-48. Sebring went on to outscore the Blue Devils 13-6 in overtime to secure the sectional championship. Complementing Lanzer in double figures for Sebring were Jake Hunter and Zane Peterson who added 17 and 10 points, respectively, while Joey Clark finished with eight points. Senior standout Justin Sweeney, the school’s all-time leading scorer, led the Blue Devils with 19 points, six rebounds and four steals. Michael Davis finished with 10 points and Blayne Brownfield had eight. Logan Bell had four assists and Nick Mundy made three steals. Sebring’s Clark pointed two a pair of keys in the win. “I can’t say enough about Zane Peterson’s defense (against Sweeney) and Jake Hunter’s ball-handling, it was outstanding all night,” praised the Sebring coach. “We just talked about shutting down Sweeney and playing good defense,” said Lanzer of the Trojans’ game plan in overtime. Lisbon had the best of things early, taking first-half quarter stop leads of 8-5 and 20-19. But Sebring took its first lead at the outset of the third quarter when Lanzer hit a fielder, giving Sebring a 21-20 lead and the Trojans went on to outscore the Blue Devils 19-7 in the frame to take a 39-28 advantage after three. “They (the Lisbon defense) were really spread out and we just felt our guards needed to penetrate and draw some fouls and get some layups, and once our kids became aggressive, turned their shoulders and had a chip on their shoulder going to the rim, I think it just changed the complexion of the game,” Clark said. 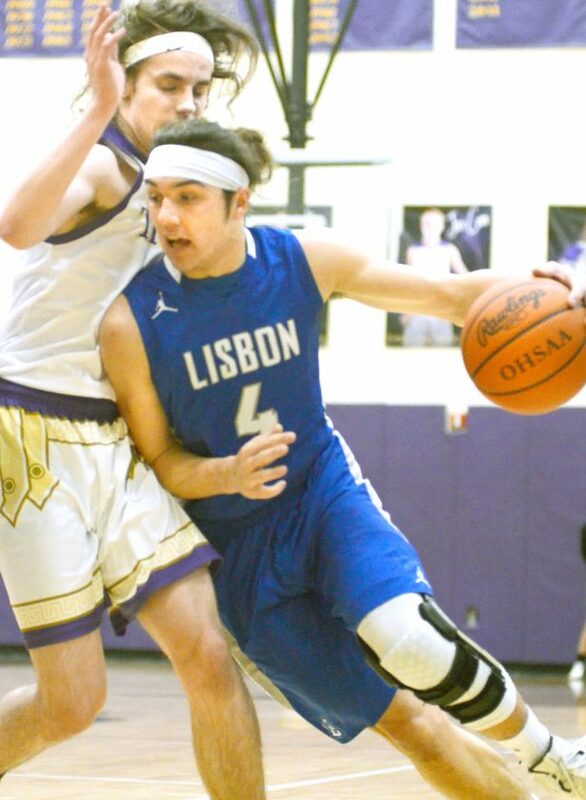 But Lisbon returned the favor in the fourth quarter, outscoring the Trojans 20-9 in the final frame and sent the game to overtime when the Blue Devils’ Nick Mundy converted a short hoop, tying things at 48-48 with 7.5 seconds left. Sebring then missed a long-range shot that bounded off the rim at the buzzer, setting the stage for the overtime session. LISBON SCORING: Nick Mundy 2-0-4 Logan Bell 1-2-4, Ryan McCullough 1-3-6, Brice Blackburn 1-0-3, Michael Davis 4-0-10, Justin Sweeney 6-4-19, Blayne Brownfield 2-2-8. TEAM TOTALS: 17-48, 11-13: 54. SEBRING SCORING: Jake Hunter 6-5-17, Connor Shepherd 0-0-0, Joey Clark 1-6-8, Matt Byrd 1-3-5, Zane Peterson 3-3-10, Gabe Lanzer 8-0-20, Frankie Lozoya 0-1-1. TEAM TOTALS: 19, 18-26: 61. Three-point goals Lisbon 9-29 (Justin Sweeney 3, Michael Davis 2, Blayne Brownfield 2, Ryan McCullough 1, Brice Blackburn 1), Sebring 5 (Gabe Lanzer 4, Zane Peterson 1).